This beautiful thing is what's known as a "Jenny Haniver," or more accurately, "a mutilated and dehydrated stingray." The origins of the craft are lost to time, but sailors once fashioned these at sea, brought them home and passed them off as dead sea monsters. 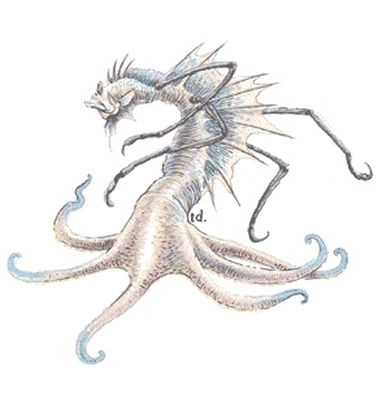 The eerie, empty "eyes" are really nostrils, and the tentacle-like limbs are formed by slicing the fins in several places. Comparing the two, it seems pretty obvious now that the Morkoth was inspired by one of these grisly trinkets, but had it been drawn a bit closer to the real thing, it may have been taken more seriously by players as a truly disturbing monster. 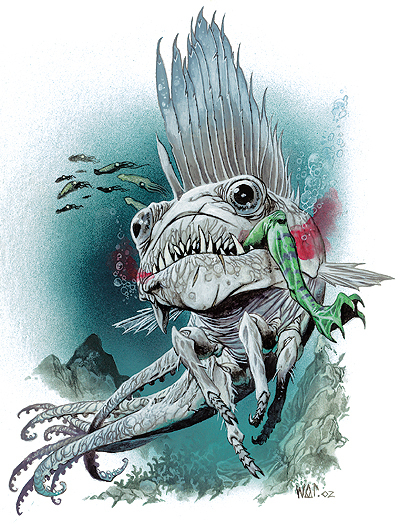 With 1993's Monstrous Manual, Tony Diterlizzi's was tasked with completely reworking the Morkoth from the ground up, scrapping any semblance to a cuttlefish or stingray carcass. Fortunately, this gaunt, pallid fish-squid-insect is quite endearing in its own way. 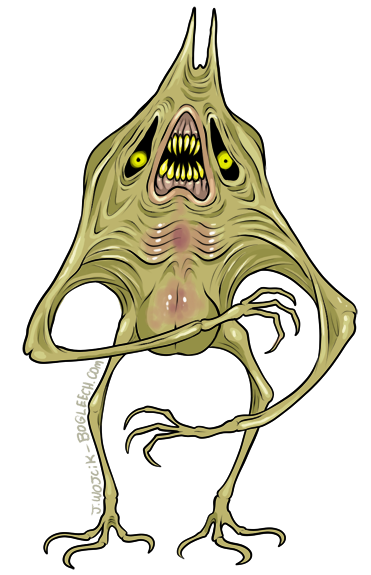 Its frail, sickly, rather timid appearance perfectly suits a creature that spends its whole life hiding in a hole, relying entirely on hypnotism to feed itself over brute strength. The degenerate, pitiful qualities are sadly lost in this most recent Morkoth, which I wouldn't like at all if not for that darling pug-dog mug. The bulging, glassy eyes are just adorable, nicely offsetting its fearsome, powerful body. The Morkoth, however, shouldn't have to look fearsome and powerful. Why is it swimming around like a shark? What happened to skulking in its hypno-hole? I vastly prefer the Morkoth as a grotesquely feeble ambush predator, helpless without its mind-warping tunnel network. Legends tell of an ancient civilization of colonial fish-folk, their gleaming cities ruled by a beautiful and delicate caste of advanced psionicists. When an unknown cataclysm claimed the workers, the warriors and even the brood mother, the remaining psionicists sealed themselves away in a network of subterranean caverns, waiting countless eons for the danger to pass. Today, the wretched Morkoth are said to be all that remain of these fallen masterminds, long atrophied into decrepit and cowardly aquatic ghouls. Maddened by an insatiable hunger for flesh, a mesmerizing psychic lure is the final vestige of a mind that once built an empire. 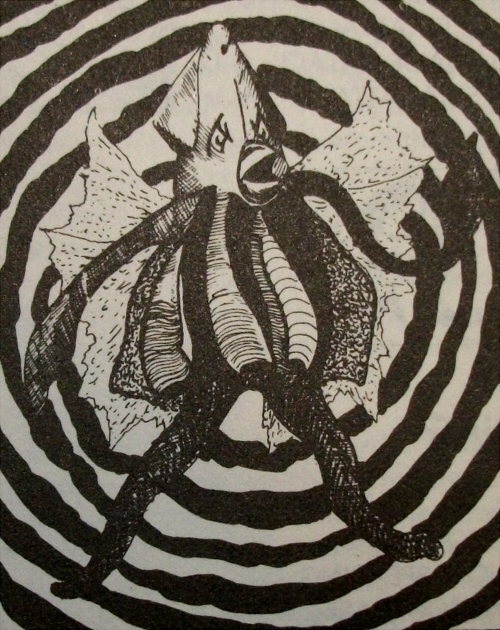 A corny story, but the kind of story the original Morkoth always sort of implied to me - there just had to be some bigger picture to these hypno-squid-rays, and I'm rather surprised that this is one monster the new editions haven't saddled with an exceedingly dramatic new background story. Somebody had to do it.